Le projet ‘WAR MADE SHANGHAI’: TOWARD A SPATIAL HISTORY OF 19th-20th CENTURY SHANGHAI (1842-1952), présenté dans le cadre de l’appel Blanc de l’ANR par Christian Henriot, a été sélectionné au titre de l’édition 2013. Il s’appuie sur une collaboration avec l’équipe du professeur MA Jun, à l’Institut d’histoire de l’Académie des sciences sociales de Shanghai. Wars have a tremendous impact on territories and their populations. Many cities were, at one point in their history, subjected to the grueling consequences of warfare. Some have suffered repeated assaults, successive cycles of destruction and reconstruction, displacement of population, and as a consequence, a remolding of their environment. Yet only a few large modern metropolises have gone through such cycles of sudden and thorough destruction, followed by periods of more or less rapid reconstruction, involving a massive regeneration of their populations. In this project, we plan to establish that Shanghai represents an exceptional – though unfortunate – case of urban space that was engulfed in several conflicts from the mid-19th century to the late 1940s. The city can also claim the sad record to have been the first city in the world to be exposed to and ravaged by modern weaponry and to have suffered from heretofore unknown levels of violence. The history of Shanghai has been told from the angle of modernization, westernization, and astounding economic development. In other words, Shanghai appears in most narratives as a « success story ». A success indeed it was. In this project, we argue that the development of Shanghai as an urban territory was conditioned by issues of defense and conflict. Shanghai thrived and prospered out of war. From the initial military foray and brief occupation by British troops in 1842 to the civil war (1945-49) and its ripples in post-war China, all through the civil rebellions (1853-55, 1860-61), revolutionary movements (1911, 1925-1927), and Sino-Japanese conflicts (1932, 1937), the city was the seat of extreme forms of violence that affected both the spatial configuration, the distribution, composition and activities of the population, and the whole economic structure in relation with its hinterland. If political decisions did trigger spatial change, especially with the creation and expansion of foreign settlements outside the original walled city, issues of security and actual conflicts by and large determined the course of spatial transformation of Shanghai. This project proposes to explore the spatial history of Shanghai through the looking-glass of war and civilian violence over a long century (1842-1952) and seeks to establish the determinants and modes of transformation of the city that resulted from warfare. In methodological terms, the project fits in the realm of « digital humanities », in particular digital history, with a partcular emphasis on visualization, GIS, and geovisualzation. It requires collecting and processing large amounts of quantitative and qualitative data and the design and implementation of innovative instruments for research. It will rely on the development of a web-based research platform and translate also into applications for interactive immersive virtual reality. A l’occasion de la clôture d’un projet de recherche international financé par la Région Rhône-Alpes, un workshop se tiendra les 22 et 23 mars 2012. 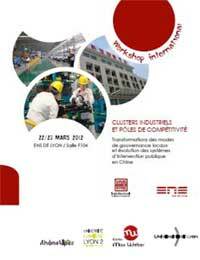 Croisant les perspectives et les pratiques, ce workshop vise à mieux comprendre la complexité des formes d’intervention publique et des modes de gouvernance locaux en Chine, au travers des évolutions marquant en particulier le fonctionnement des clusters industriels.